The lead-up to Donald Trump’s inauguration was a nice teaser for his presidency, especially in the sense that it seemed like it took forever, nobody reputable wanted to be involved, and it ended up being a total shitshow. We’ve had an inkling of that last part for a while now thanks to the photos of his pitiful crowd size, but now an Associated Press report suggests that things were even worse behind the scenes. For starters, Trump’s team repeatedly claimed that the inaugural concert and balls would be relatively low-key and “workmanlike,” but the concert in particular ended up costing a staggering $25 million—compared to the $5 million it cost President Obama’s team to put on a similar show in 2009. That’s pretty ridiculous on its own, but it becomes a little confusing when you compare the lineup of Obama’s concert to Trump’s. Obama had (among many others) Bruce Springsteen, Mary J. Blige, U2, Beyoncé, and a bunch of famous people, while Trump had Toby Keith, Three Doors Down, and—as noted by The New Yorker—a group called the Piano Guys that involves some YouTubers who all play a single piano at the same time. Granted, Obama is a likable guy with a lot of famous friends who would happily perform for him for free, while Trump is a heartless goon whose best friend is a fake spokesperson, so it makes sense that it would be a little pricey to get stars like Three Doors Down and the Piano Guys. That being said, $20 million is a whole lot of money to blow just because you’re jealous of your predecessor. 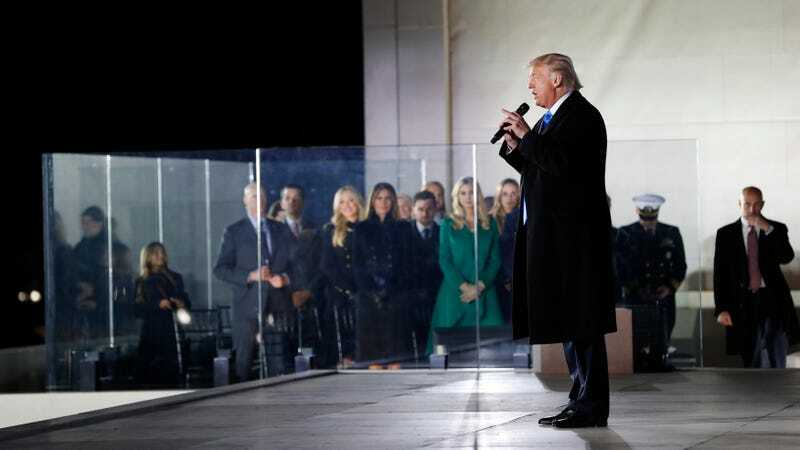 Thankfully, that money came from Trump’s gullible fans and his fellow rich assholes, with the AP story pointing out that the inaugural committee raised $107 million for the whole ceremony—nearly double what Obama raised for 2009. Presumably recognizing that they had too much cash to pay for a weird concert and a ripoff cake, Trump’s team said that any leftover money would be donated to charity. It’s now September, and though this may come as an absolute shock, it looks like none of the money has gone to any charities yet. The inaugural committee has “helped pay for redecorating at the White House and the vice president’s residence in Washington,” though, so at least it’s going to a worthy cause. As for where the rest of the money has gone, nobody seems to know—which is always a good sign when dealing with a famously trustworthy businessman like Donald Trump. The chairman of Trump’s inaugural committee, whose last name happens to be Barrack, says that a third party had completed a “full and clean” audit of the committees finances, but two Trump associates said that they were “unaware” of any such audit. Other sources suggest that all of the money is gone, and that’s why none of it has been donated yet, but that’s not exactly a better excuse.